After years of thinking about it, I have finally got a proper website again, hope you like it and visit back again soon. My love for photography really started at the dawn of the digital camera age, my first digital camera being a fuji point and shoot, although expensive and low megapixel at the time, it was great fun to edit the photos on the pc rather than wait for the photos to come back from the developers. I brought my first DSLR around 2005, it was a Canon 300D and a amazing camera at the time, but by todays standards very basic. It still works today, the shutter has been fixed and it works perfectly. I moved on from the 300D in 2007 to the Canon 30D, a bit more advanced body with a couple more megapixels that all my lenses worked on, so I stuck with Canon. 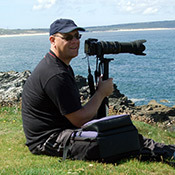 I moved onto the Canon 7D around 2010, mainly for the higher megapixel and the cropped sensor for wildlife photography. My newest addition is the 5D mk II, which I use solely for landscapes and sunset photography. I share nearly all of my photos on the flickr website, a hobby which has grown on me alot since I lost my old websites back in 2007. I have met lots of people from various flickr meets and contacts, some are good friends that I go out regularly with, all thanks to flickr. It's a great community for local and worldwide camera related stuff. At the current time of writing this, I am sharing well over 4000 photos, I have had well over half a million views from all over the world. My flickr website is called The Hidaway , please find time to check it out. I recently joined Carnkie camera club, which I enjoy going to when I got time, a great group of fun camera fans like myself that meet every Wednesday night. The one thing I keep putting back is the ability to sell my photos, so that is something that I will try to look into in the coming year, watch this space! So thank you for visiting, hope you have time to check out the rest of the photos on here and also on my flickr website and on my new facebook page .